The Planning Commission is appointed by the City Council to perform duties related to land use planning for the city. In that capacity, the Commission is responsible for developing a master plan, recommending amendments to the zoning ordinance, and reviewing and approving site plans for new developments, among other duties. 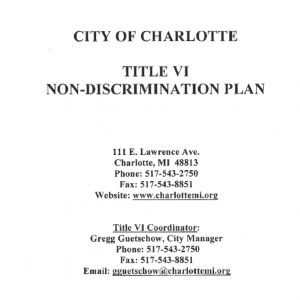 The Planning Commission derives its authority from Michigan’s Zoning Enabling Act, from the City of Charlotte Charter and from the zoning ordinance. except for Election Days or Holidays at 7:00 pm. Council Chambers, 2nd Floor City Hall.